Muslim women activists took to social media to take a stand against the Republican candidate’s bigoted drudgery. 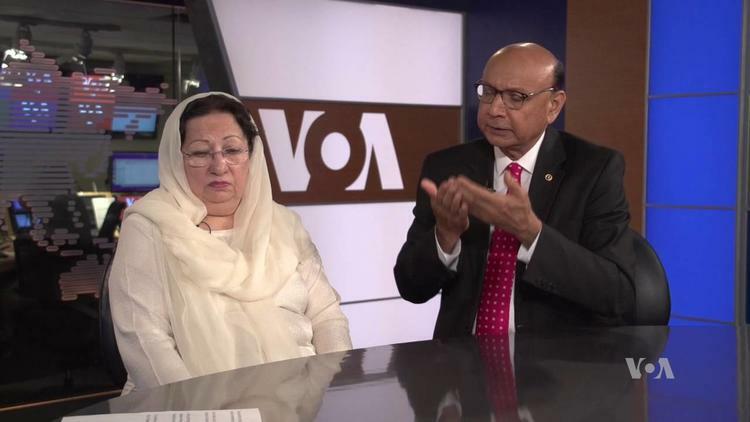 Muslim-Americans Khizr and Ghazala Khan, parents of the late Army Capt. Humayun Khan who died while serving in Iraq, became the latest targets of U.S. Republican presidential nominee Donald Trump’s incessant bigotry. While speaking at the Democratic National Convention last week, Khizr Khan addressed the crowd, taking verbal jabs at the GOP frontrunner, and with his wife Ghazala by his side — which prompted Trump to comment that perhaps she wasn’t allowed to speak because of her Islamic faith. Soon Muslim women and allies, mostly from the U.S., took to Twitter en masse using the hashtag #CanYouHearUsNow to take a defiant stand against Trump’s bigotry. The incident grew after Trump appeared on ABC’s George Stephanopoulos show Saturday and remarked, "If you look at his wife, she was standing there. She had nothing to say. She probably — maybe she wasn’t allowed to have anything to say. You tell me." The Republican candidate continued to stir the pot amid growing backlash where he tweeted about how the whole debacle was not a feud with Khan, but that it was about “radical Islamic terrorism,” the GOP nominee’s go-to rally cry. Ghazala Khan addressed Trump’s bigoted claims about her so-called silencing twice over the weekend. On Friday, in an interview with MSNBC’s Last Word with Lawrence O’Donnell, she said, "First of all, I thank all America who listened from their heart to my husband’s and my heart, and I’m so grateful for that. And it was very nervous because I cannot see my son’s picture, and I cannot even come in the room where his pictures are. That’s why when I saw the picture at my back I couldn’t take it, and I controlled myself at that time. So, it is very hard." In an op-ed written for the Washington Post Sunday, Ghazala Khan offered a heartfelt refutation of Trump’s Islamophobic mischaracterization assumptions: "Here is my answer to Donald Trump: Because without saying a thing, all the world, all America, felt my pain … Walking onto the convention stage, with a huge picture of my son behind me, I could hardly control myself. What mother could? Donald Trump has children whom he loves. Does he really need to wonder why I did not speak?" Grief left the mother speechless – not a purportedly oppressive religion – a fact Muslim women want Trump and his fans to know well.